Roast the sweet potatoes: Preheat the oven to 400 degrees. Spread out the sweet potato cubes on a lined baking sheet. Drizzle olive oil over the potatoes, sprinkle with salt and pepper and toss to combine. Roast the sweet potato cubes for about 15 minutes or until tender and the edges are browned. Make the avocado chickpea spread: While the sweet potato is roasting, mash the avocado in a bowl. Squeeze in the juice of one lemon and add in the garlic and onion. Add in the chickpeas, roughly mashing them into the mixture. Season with salt and pepper to taste. Mix until thoroughly combined. Assemble the wraps: Spread the avocado mixture on each wrap. Layer equal portions of sweet potato cubes, red pepper strips, and greens over the avocado mixture. Squeeze some lemon juice over the top of everything. 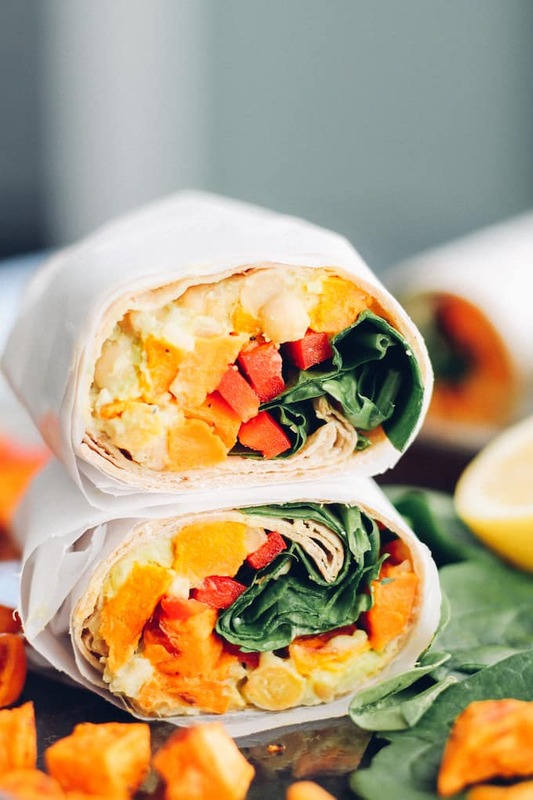 Roll up the wrap like a burrito and enjoy!